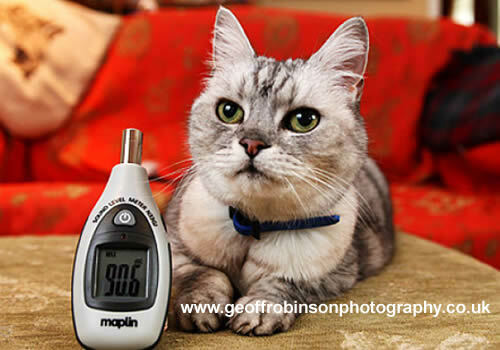 Smokey is now the 2nd loudest purring cat in the World as The new Guinness Wold Record for the loudest Purring cat has been awarded to Merlin from Devon in the Uk who on the 13th May achieved a decibel rating of 67.8 when measured at a distance of 1 metre away. Smokey is the worlds loudest purring cat and holder of a Guinness World Record. Gunniess World Record. Smokey has been featured in every UK National newspaper, on Daybreak TV,"This Morning",BBC and Anglia. She has also been filmed by ABC News 'Good Morning America', NBC News 'Today',Animal Planet's 'MustLove Cats' show and also Ukraine TV AND on radio stations all over the world including Canada,Australia,South Africa,New Zealand, America and the Gulf States and even the BBC World Service. 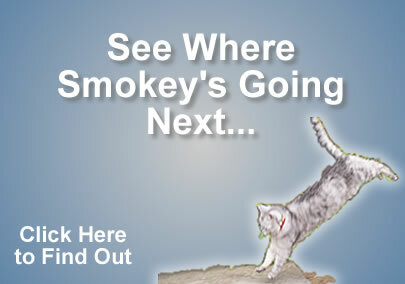 Smokey is featured on web sites all over the World. If you google her name you will get around 10,000,000 hits. Smokey has been recorded at purring at a level of 67.7dB which is 14 times louder than the 25dB of a normal cat.All measurements were taken at a distance of 1 metre away from the cat. Smokey's purring reaches a sound level comparable to a hairdryer or a lawn mower.Smokey's purring is louder than normal converstation. The UK National Press ran with headlines off 'Purrs like a Boeing 747' Imagine trying to watch television with that amount of contentment humming and cooing in your lounge. Smokey's exceptional "singing" talent was discovered when she volunteered with her owner to help promote the spaying and neutering of cats in her home town of Northampton in the United Kingdom. She was hoping to raise awarness about the welfare benefits in spaying/neutering and draw attention to the UK's leading feline charity Cats Protection.